Car accidents are one of the most common causes for injuries for Canadians. Motor vehicle accidents can cause a wide range of injuries ranging from whiplash, broken bones, psychological effects, chronic pain, and, unfortunately, sometimes even death. Not all injuries sustained as a result of a car accident become apparent right away. Soft tissue injuries can surface days after the accident. Most car accident victims require lengthy and costly rehabilitation; combined with lost wages and other related expenses, a car accident can leave a family emotionally and financially devastated. If you have been involved in accident, you entitled to accident benefits-medical rehabilitation benefits, income replacement benefits, attendant care, and the non-earner benefit. If you have bought additional coverage, you may also be entitled to caregiving and housekeeping benefits. If you injuries are deemed to be catastrophic, you maybe entitled to much higher coverage for your injuries. Rest assured that the insurance company will do anything to limit your entitlement to these benefits. If you are not fully at fault for your accident, you maybe entitled to Tort compensation from the at-fault party. The heads of damages that you maybe entitled to are pain and suffering, future medical care, loss of competitive advantage, loss of income, and out-of-pocket expenses. The Ontario legislation is complex and has laws that try to restrict compensation for accident victims. 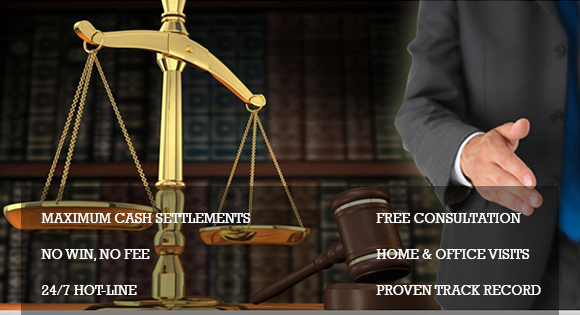 Our team of lawyers knows the complexities of the systems and understands the nuances that allow us to recover maximum compensation for our clients. Auto insurance companies are well known for withholding payments and delaying the process, which leaves victims confused and unsure of how to proceed. The recent changes to the legislation have made the claim process even more confusing, and, in some cases, even more costly for injury victims to get all the benefits they are entitled to. Insurance adjusters don't represent the victim; they represent the interests of the insurer, meaning their job is to keep the costs of every claim as low as possible. Doing so will often leave victims without the necessary available benefits and rehabilitation they are entitled to. On the Tort side, adjusters will try to trick the victim into accepting settlement amounts that don't fully compensate the victim for his losses. By hiring a personal injury lawyer, you will have somebody on your side that will even the battleground with the insurance company. If you have been injured in a motor vehicle accident, you deserve compensation for your injuries. Even if the other driver had no insurance or even fled the scene, you are still entitled to Tort compensation. If you are at fault for the accident, you still may be entitled. Motor vehicle accident claims have their own inherent complications, and having an experienced legal team on your side is crucial for obtaining the compensation that you deserve. Our team of personal injury lawyers has helped thousands of victims get the benefits, rehabilitation, and compensation that they deserve. With our legal team in your corner, you can concentrate on getting better while we ensure that justice is served.